This blog is from another question submission which I received recently and will focus on how to create deception in your service game. 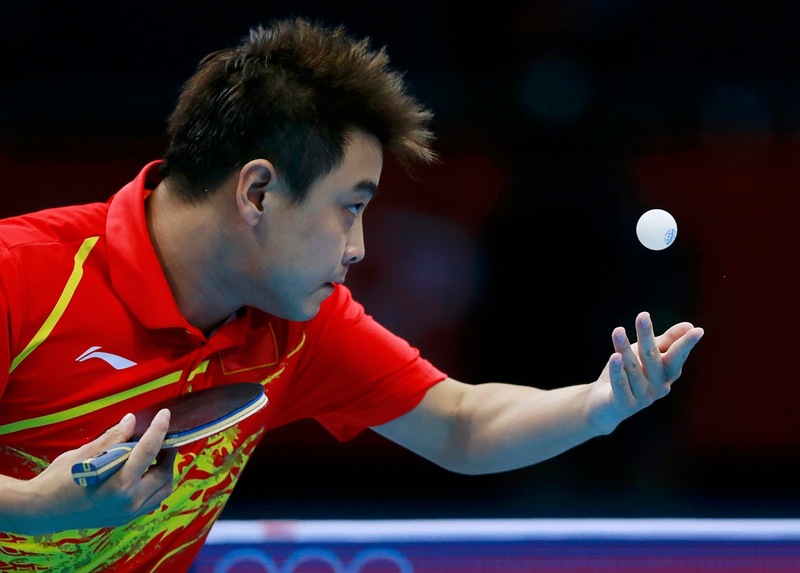 The serve is so important in establishing a foothold in a table tennis match that making it as difficult to read as possible is crucially important, this blog will offer some tips as to how you can increase that difficulty level. So here are 5 simple tips to follow in order to improve your service and ability to make the serve more difficult to read. It could be the most basic service motion possible but behind every deceptive and difficult to read service is a very simple contact motion. When I work on improving the spin or contact of my serve I strip it back down to the bare essential motion. If you can master the basic contact for each spin and maximize the spin produced in that serve then you can then work forward and put the basic contact into some more creative service motions. Once you have the basic contact for each main spin type (top, side, back) it becomes useful for you to combine spins together. By making contacts across the bottom axis of the ball and contacting in different directions you can combine top/side, back/side serves and change from a continuous trajectory to more kick-type serves where the ball path deviates sharply after the second bounce. Having variations in movement as well as just spin can make the ball much more difficult to read. You can see Jun Mizutani's serve in the video below and see the effect of combining sidespin into top and backspin serves and the movement patterns of the serve trajectory! Not only can you cause deception in spin direction and movement but also in changing between spin and no spin. The ability to control the contact of the ball on service can create a huge advantage in a match, particularly when a no spin serve may create the perfect surprise. In order to master the no spin serve it needs to look like spin is being imparted on the ball, this means you must be able to maintain a level of acceleration into the contact point. If the serve contact and stroke looks too slow and soft it will be easier to read as having less spin. The best way to execute the serve is to hide a flat sharp contact within a service motion so you are hitting the back of the ball without making a brushing motion on the ball. Another option is to make the service motion angled and then quickly change to a flat contact or switch direction on the ball contact. The second method allows the momentum into the ball contact to stop on the direction change and create less spin on the ball. The first step up from basic service motions is to make a simple motion with a basic added deception. You can try and do a basic pendulum serve and attempt to change the direction of the follow-through (after ball contact). You can try and make a backspin serve and pull your racket upwards after the contact point to make it look like topspin or vice versa. These motions and follow-through motions are still simple but are important in getting smooth actions and core service motions. The final step is to incorporate steps 1-4 together into your final match serves. Once you have mastered the first 4 steps all you need to do is make some creative service motions, changing the spin, trajectory and follow through. The best part about this process is you can break it down into simple parts and as such working on troubleshooting issues becomes simpler. I may have match serves to use now but if I want to work on the spin amount I will go back and revisit step 1 in service practice, afterall the core motion of the serve is where the spin comes from. This is a great time to start practicing the serves against training partners and getting feedback on how effective the service is. You can also play games where only one player serves for the whole game which gives you a chance to see how reliable your serves are in a match and whether you get the outcomes that you want from them. So I hope this has been helpful to you all and you can work through the steps to master the art of deceptive table tennis service! Remember if you have any troubles with your game or want a detailed answer to a question, be sure to email mhtabletennis@gmail.com any time! Yep. Best article I've seen on serves. Here I was able to discover how to improve my playing skills! Whether you are a beginner or a professional sportsman in the field of table tennis, you can easily find this post exclusively fantabulous! I believe that you serve your way to glory! Doesn't matter whether it's table tennis or lawn tennis, the service should be perfect. So that we can easily gain points, there are several kinds of serve techniques we should apply in our game plan to beat our competitor. From this article, we learn some basic serve techniques and to gain points to be the match. Thanks for this wonderful overview. Serve techniques are very popular and different players are having their own techniques, we may follow their techniques but implement our own style in the game.